This filly simply takes your breath away! We are thrilled with this breeding and Finca has exceeded our expectations. She is a dark bay with the most beautiful head and expression that makes you gasp for air. Very modern, leggy filly, extremely light on her feet with a fabulous canter. She is very sweet and so so feminine … she is the whole package! 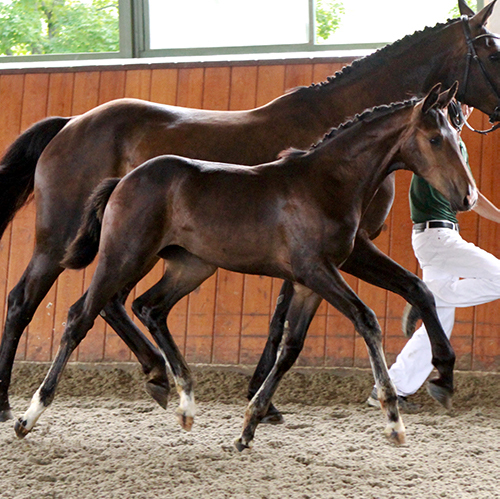 Finery has a fantastic dressage pedigree, he is sired by Fürstenball who was Champion of his Stallion Performance Test, winner of the 2011 Bundeschampionat, and winner up to the S level. He has been even more successful as a sire and has an incredibly high FN Dressage Index of 175. Finery’s grandsire, Diamond Hit, was an international Grand Prix competitor who has 56 licensed sons to his credit. Finery’s dam is making her own mark as well and has already produced two licensed sons. 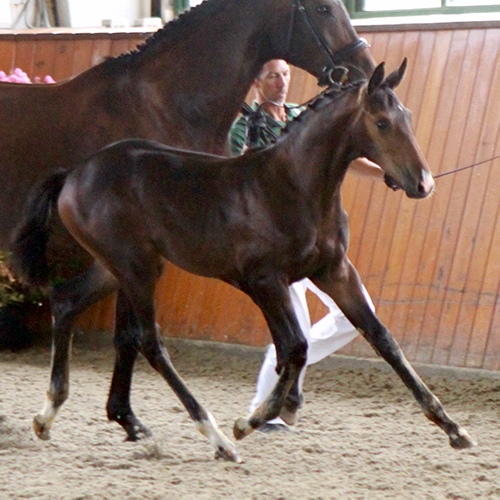 Finery was licensed in Germany and completed his 30-Day test with a Dressage Index of 8.03 and a 9.5 on Character. He was named Champion Stallion and Reserve Grand Champion of the 2016 Dressage at Devon show and under Michael Bragdell, Finery qualified for the US National Young Horse Championships and placed 3rd in the FEI Six-Year Old division in 2017. We are thrilled to have one of the foals from his first crop from this young promising stallion. Regalia, sired by Royal Prince has been an outstanding broodmare for us, producing fabulous riding horses with incredible temperaments and rideability. She is the dam of Serendipity and Sir Royale, full siblings sired by Sir Gregory and De Nada who was sired by De Feiner Star. Royal Prince was Reserve Champion at his Stallion Performance Tests, earning 10’s for rideability and walk, and 9’s for trot, canter, and willingness to work. He twice represented the US at the FEI World Championships for Young Horses, including a 4th place finish in 2004, and competed through Prix St. Georges. His sire, Rohdiamant, was a highly successful Grand Prix dressage competitor who was short-listed for the U.S. Olympic Team with Lisa Wilcox. Grandsire Rubinstein I also competed at the Grand Prix Level and has had a legendary influence on sport horse breeding around the world. It impossible to guarantee anything with horses but Finca is bred for rideability, temperament and performance and with such greats as Florestan, Donnerhall and Don Schufo in her extended pedigree plus the knowledge we have of Regalia’s past offspring I think we are fairly safe in saying that Finca would be an outstanding young horse prospect for both the amateur and professional rider alike.